Psalm 103:2-3. "Bless the Lord, O my soul, and forget not all His benefits, who forgives all your iniquity, who heals all your diseases." I cherish this psalm as one of the most beautiful passages about the true nature of God's forgiveness, straight from David's heart. Not only does the Lord forgive and heal, He crowns our life with goodness and strength, renewing our daily steps as with the wings of eagles. The Lord is merciful and gracious, slow to anger, slow to scolding. He does not keep score nor repay our backslidings and lack of fidelity as we deserve. Our sins are removed from our lives as high as the heavens are above the earth, the east from the west, and tossed behind His back into the depths of the sea, never to be heard from again (see Isaiah 38:17; Micah 7:19). Merciful, gracious, compassionate, long-suffering, steadfast in love is our God! Without God's forgiveness, there is no life, no salvation. With His forgiveness, the doors of paradise are open wide, but forgiveness has two faces: from God to you and from you to your neighbor. Your neighbor is not only the guy who lives down the street but also includes your closest "neighbors": your spouse, your children, your fellow employees, your fellow-saints who sit in the pew next to you. A heart that is melted by the love of God is a heart smitten by the blood and pain of Jesus upon His cross. Such a heart will always stand ready to forgive those closest to us who often bring us the most pain in life. Can't forgive your spouse, can't forgive your son, your daughter, your neighbor, or that irritating saint from your church? Then turn your face to God and think of Christ first—His brutal, bloody cross. He is the only reason God forgives you, your backsliding, your lack of fidelity. Then, turn your face to your neighbor and see the same cross standing between you both. Forgive, as Paul says in Ephesians 4:32—forgive, even as God in Christ has already forgiven you. God's forgiveness is not conditional. He did not seek your opinion nor ask for a demonstration to prove you are worth the sacrifice when He sent Christ Jesus into the world to save our souls. Our feeble attempts to amend our sinful lives are dwarfed by the immensity of God's grand forgiveness. Forgiveness isn't free. 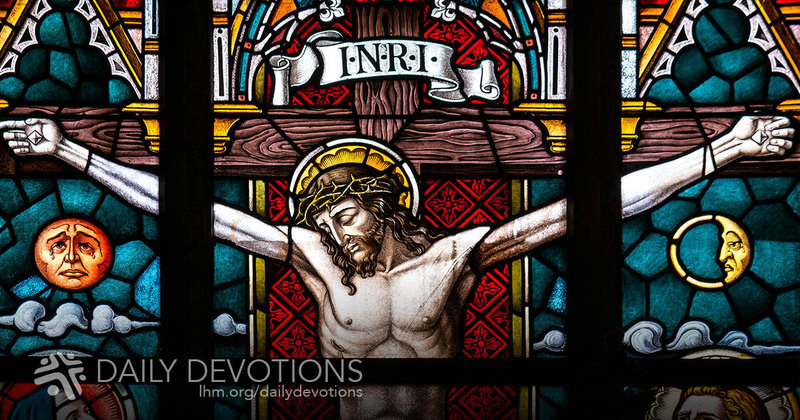 It came with a priceless price tag, the cross of Christ, and a sacred obligation. The ancient Romans used the Greek gods for their own religious purposes. The Roman god Janus was the exception. He was uniquely Roman. Janus was the god of the doorway, the god of entering and exiting, a two-faced god, looking forward and looking backward. For the Romans, January, the month dedicated to Janus, inaugurated new beginnings and marked out old departures. Janus, the two-faced Roman god, looked both ways. Your God, O Christian, He is infinitely greater. His eyes see the whole sweep of your life, backwards and forwards. The Lord looks upon your life and in Christ Jesus forgives all. Such unconditional forgiveness comes with a sacred obligation because God's forgiveness has two faces. Forgive others, just as you have been forgiven at the cross of Christ. THE PRAYER: Heavenly Father, whenever I find it most difficult to forgive others the wrongs they have done to me, lift my eyes to the cross, and I will learn to forgive once again. Amen.